Richard Llewellyn (real name Richard Dafydd Vivian Llewellyn Lloyd) was a British novelist. Llewellyn was born of Welsh parents in Hendon, north London in 1906. Only after his death was it discovered that his claim that he was born in St. Davids, West Wales was false, though of course he was of Welsh blood. Several of his novels were dealt with a Welsh theme, the best-known being How Green Was My Valley (1939), which won international acclaim and was made into a classic Hollywood film. It immortalised the way of life of the South Wales Valleys coal mining communities, where Llewellyn spent a small amount of time with his grandfather. Three sequels followed. He lived a peripatetic life, travelling widely throughout his life. Before World War II, he spent periods working in hotels, wrote a play, worked as a coal miner and produced his best known novel. During World War II, he rose to the rank of Captain in the Welsh Guards. 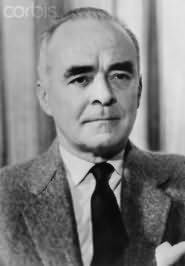 Following the war, he worked as a journalist, covering the Nuremberg Trials, and then as a screenwriter for MGM. Late in his life, he lived in Eilat, Israel.